Pickard offers 10 styles of crystal glassware. Three of them may be monogrammed. 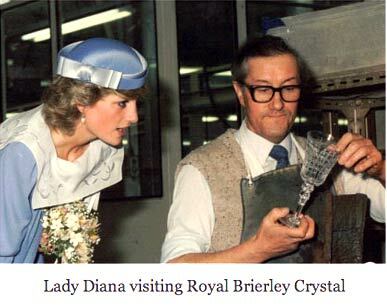 A rich heritage spanning 300 years has made Royal Brierley the most prestigious name in English lead crystal. The quality and craftsmanship associated with this famous name have long been recognized by the unique distinction of two Royal Warrants of appointment as the Royal British glassmakers. The first was bestowed by King George V in 1919 and has been renewed by each successive monarch. In 1995, the company was delighted to be granted also the Warrant of HRH The Prince of Wales. Principally, the company has grown under the guidance of three families - the De Henzels, the Honeybornes, and most recently, the Silvers. It was during Joseph Silver's period of control that the company leased the Moor Lane Glasshouse at Briar Lea Hill. His daughters married William Stevens and Samuel Cox-Williams, who took control of the business in 1847 and the company became known as the Stevens and Williams Glassworks. This name was used until the 1930's when the company became Royal Brierley Crystal to signify its appointment as the Royal British Glassmakers. Throughout our 300 year history, our innovation and design skills have set Royal Brierley apart from other manufacturers. As a prime influencer in the development of glassmaking throughout the West Midlands, we have always been able to attract the brightest and most talented designers and skilled craftsmen. Their expertise and the beauty of the crystal they have created are appreciated throughout the world. Many of their works have become quality museum pieces. Royal Brierley crystal has graced the banqueting tables of monarchs, heads of state and other dignitaries all over the world, serving as a brilliant ambassador of British craftsmanship. Today the company continues to supply Buckingham Palace, Highgrove House and the Palace of Holyroodhouse. Royal Brierley has often played host to members of the Royal Family including the late Queen Mother and George VI, the Queen and Prince Phillip, Princess Margaret and the Princess of Wales. In 2009, Royal Brierley started an exclusive partnership with Pickard China. This new business relationship partners the oldest fine china company in America with the oldest crystal company in the United Kingdom. Working together, Pickard and Royal Brierley have gone to market with a truly unique and beautiful collection of crystal stems and giftware. 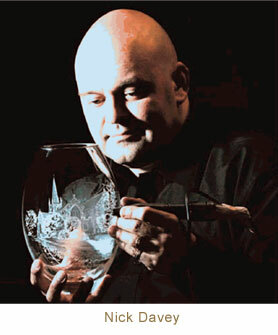 Royal Brierley's world-renowned master engraver Nick Davey has worked for the company for over fifteen years, spending his early years in the "hot shop" learning the basic skills of glassmaking. However, this was not Nick's forte and he soon realized where his talents lay. He spent some time working for Wedgwood, where he started perfecting his skills, but later came home to roost in Torrington, Devon, England, where he was born, and the home of Royal Brierley. 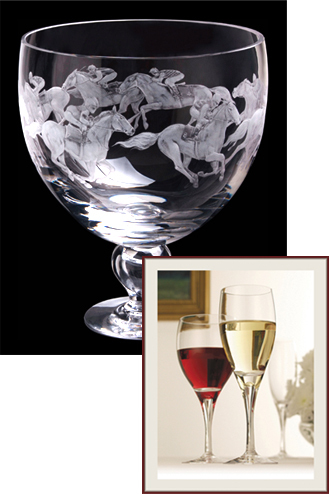 Nick is an established figure in the glassware industry and a member of the Guild of Glass Engravers. He travels the length and breadth of the UK making personal appearances and demonstrating his craft, as well as doing signings and personalizations. Nick also spent time in Japan at the famous Takashimaya department store where, as an ambassador for British craftsmanship, he was a very popular attraction. When asked how he acquired his talent, Nick's answer is very modest. He says he really doesn't know, that it just comes naturally. Two things are certain - his hand engraving expertise is in high demand to supply prestigious commissions and awards, and his ability to translate lifelike images into crystal is one that many clients have come to prize and value.